Enjoying car journeys with my Dad throughout my childhood listening to the music he listened to and loved when he was younger. Sharing the enjoyment. Different, fun and more exciting as a style than what I was exposed to as a child in the late 90’s/early 00’s. Made the journeys fun, but also would make me smile and (slyly) dance throughout the day. Conversations with my Dad wherever possible about those styles of music and the culture that came with it. Watching Quadrophenia and wishing I was around when this music was popular and a lot more common. Starting secondary school. Burning all my dad’s CD’s from the car onto my laptop/mp3 player. Having a long walk to school on my own and taking the opportunity to listen to them all and zone out, imagining myself in the scenes I’d heard about and watched in documentaries or movies. Where is the new music that is similar to these styles? I may find some… but why isn’t everyone else loving it as much as me or as much as they did in the times my Dad talks about? Discussing these interests with new people in University research. Attending niche events for this genres of music. Loving the night! Singing, Dancing & dressing up! Digging out the old downloads. 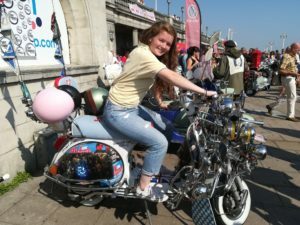 Attending the Brighton Mod Weekender with my family – something me and my Dad had spoken about since I was young. Learning that I may not actually love the music and the associated culture as much as I have done if it was as popular now, as it was at its peak, and when all the stories I hear about are from. I love it now as an escapism and a temporary option to place myself in the music’s time, through the option to listen when I want, and occasional themed events. Learning that it was popular then for all sorts of cultural, economic, social and technological reasons. Those aspects are different now and if these genres were to be as popular now, it may not lead to the same kind of result in the sound, style or cultural practices. I learnt to love the genres again and be happy with them in a different context to which I initially fell in love with. Emma Benningwood is a third-year student BA at Birmingham City University studying Media and Communications. Emma is particularly interested in music, events, PR and fan cultures. Her study projects to date have focused on: the importance of fan adoration and community for bands that are on hiatus; artist commercialisation and its implications on their audience’s identification as a fan or subculture member; how charities impact regional music economies; and what influences fan loyalty in the Mod subculture. She is currently working on her dissertation which explores the ways in which Reading Festival uses programming as a promotional tool and the subsequent audience reactions.